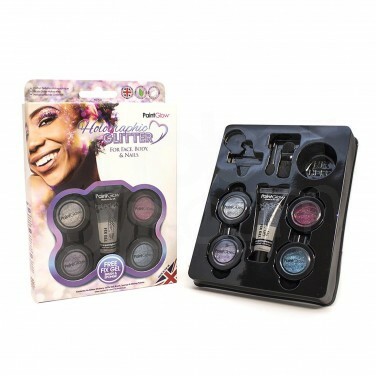 Go all out with gorgeous sparkle and glittering shine with this cosmetic holographic glitter shaker set for your face and body! 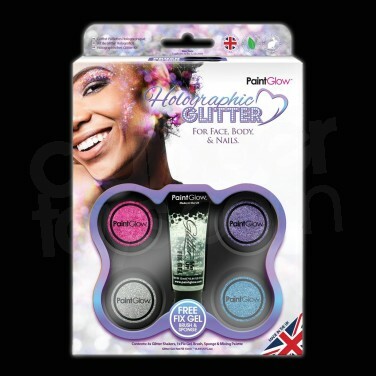 Go for glamorous sparkle and shine with cosmetic holographic glitter to define your looks! Ideal for parties, festivals and more, the holographic glitter shaker gift set contains all you need for a sparkling makeover including 4 x 13ml glitter shaker pots in pink, blue, silver and violet, a tube of glitter fixing gel, an applicator brush and sponge and a mixing palette. Simply apply the fixing gel to the areas on your face, body and even nails that you'd like to define and lightly brush over the glitter for gorgeous sparkle! When the night's over, simply remove with a face wipe. Easy! 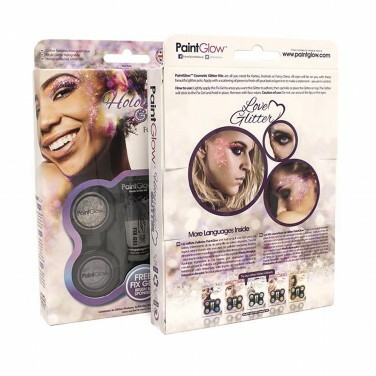 Sparkle and fluoresce all night long when you accentuate your looks with UV body glitter!